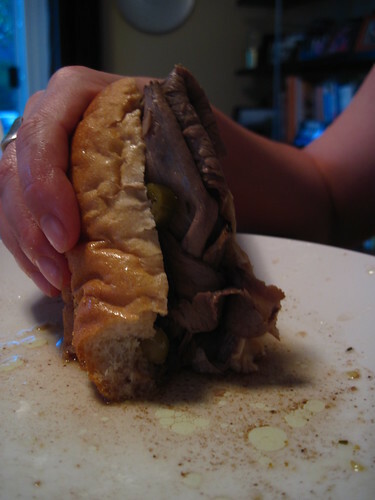 The Chicago Italian Beef Sandwiches that I made for Mixed Signals this year were a rampaging success. Making allowances for differences in giardiniera and breads, this stuff tasted just the way it should, the way it tastes at Al’s or one of the other stands in Chicago. Beefy, salty, lightly fatty, fragrant with garlic and oregano, vinegary and spicy from the pickles, and just barely holding its structural integrity due to immersion in the delicious broth. I used this recipe because there were lots of comments from born-and-raised South Siders who swore it was the genuine article. I followed it closely, though I did double it and make two 5+ pound rump roasts, I studded the roasts with garlic, and I doubled the gravy for each batch to end up with a quadruple recipe of juice. That juice reeked in a terrifying manner of oregano, to the extent that I was worried I’d overdone it, but after an hour or less of simmering, I sieved out the oregano and the garlic, and added in 4 more bouillon cubes and 6 cups more water. I was worried that canned beef broth would taste of the can, so I used all bouillon cubes, and I’d do the same next time. This wound up just perfect, not too strong of oregano, not too spicy from the hot sauce, not too salty. The roasts smelled absolutely dreamy, and honestly they would have been delicious just as they were, sliced and served. But I put them through the meat slicer — home meat slicer FTW, again! — and then into the cooled broth to soak. Due to logistical pressures, they were only in for a few hours the day of the party, but I think that was plenty. I didn’t notice any lack of flavor in the meat itself, and it didn’t overcook due to too long a stay in hot broth. I put the broth and meat into the crockpot to serve it, which worked out well. A quick 4 minute trip in the microwave got it up to temp, and then I left it on low, which kept things hot without toughening the beef. Giardiniera and hefty rolls were handcarried from Chicago last week, and we augmented with some other sub rolls from Costco that we left out for a day to stale up. Everyone seemed to like it, but the best compliment was from another former Chicago dweller who made a point to thank me for making something just like he used to eat when he lived there, something he missed pretty bad. I know the feeling. This entry was posted on Sunday, July 10th, 2011 at 7:45 pm	and is filed under In the Kitchen. You can follow any responses to this entry through the RSS 2.0 feed. Responses are currently closed, but you can trackback from your own site.